Notably, SHOT 2019 is this week, also known as Firearms Industry Christmas. There’s a little less on the table than usual that piques our interest here, so next week we’ll either do a pair of best-of articles, or reserve a section in What We’re Reading for it. The US just recognized the president of Venezuela’s National Assembly as the interim president of Venezuela itself – “In its role as the only legitimate branch of government duly elected by the Venezuelan people, the National Assembly invoked the country’s constitution to declare Nicolas Maduro illegitimate, and the office of the presidency therefore vacant. The people of Venezuela have courageously spoken out against Maduro and his regime and demanded freedom and the rule of law,” President Trump said in the statement. Singapore to buy a small number of F-35s – Don’t forget they have that flat-topped ‘Joint Multi-Mission Ship’ coming, too. I predict the heyday of the F-35B is going to be a lot like the heyday of the Harrier, where suddenly every second-rate power who can put a flat deck on a ship has an aircraft carrier. 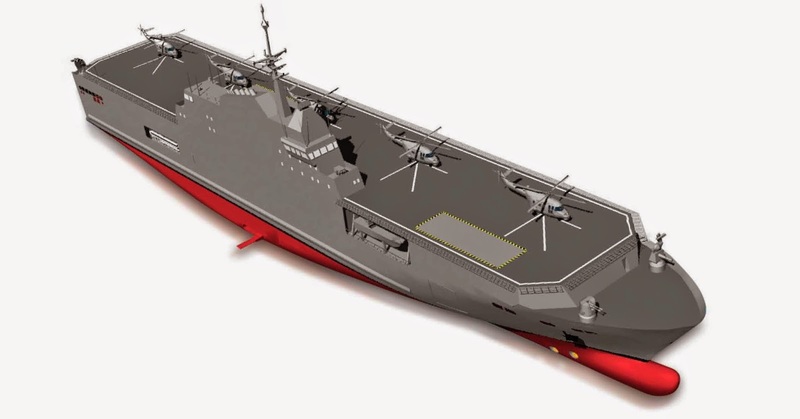 Here’s that Joint Multi-Mission Ship for you – You would have to make the elevator bigger, maybe by extending it over the deck edge, but other than that, I bet you could get an F-35B off that. How do we keep the F-35 reliable for 50 years? – I was under the impression we would a) buy spare parts and b) perform regular maintenance. If an F-35 airframe is going to last 50 years, though, I expect there to be much handwringing in Congress and the Pentagon about the price of rewinging such old airframes. War on the Rocks: should we bring back homing pigeons for EW reasons? – The war in which homing pigeons were most successfully used as a means of battlefield communication was the Great War. Notably, the Great War featured largely static lines. Pigeons don’t work very well when both your headquarters and your line troops are highly mobile. George Washington’s maritime world – I’m taking recommendations for a long, in-depth look at the Wars of the Revolution and the Napoleonic Wars. Sound off if you have any. Big Army considering a 6.8mm round – This story came up first on Discord, where you’ll often see items which end up here, or source material for articles in progress. For instance, parvusimperator just linked a report on stealth Blackhawks and told me not to include it here, so let that be an encouragement to stop by sometime. Also, cost savings on the FFG(X)! – On the one hand, cost savings are great. On the other hand, it’s still $800 million per hull. On the Tu-22M3 and the renewed Backfire threat – Includes juicy, juicy numbers on cruise missiles, speeds, and ranges. The most sobering part is that with missile ranges of 600 to 1200 miles, it gets very hard to intercept the bombers before they launch. The J-20 joins the carrier-based F-35 variants in lacking an internal cannon – I still reflexively want to shout “But Vietnam!” Parvusimperator thinks it’ll be fine. The Coasties can’t stop most of the cocaine coming into the US – Sounds like it’s time to start issuing letters of marque again. The Soapbox, now brought to you from the Pacific Ocean! On second thought, we’d have to move to Occupied Californistan, and our PMC license probably wouldn’t be good enough for concealed carry, so maybe not. The ARX-100 wins a contract! – Known to the Soapbox as the Beluga, Beretta’s AR competitor hasn’t seen much success before now, but will soon be the standard infantry rifle of Romania. A SHOT preview: the Franklin Armory Providence – The Providence is a manual-action carbine, where the trigger operates the bolt prior to dropping the hammer. Very clever, and handy both in Europe and in the worst parts of the US, where manual actions are generally still unrestricted. Aimpoint’s new fully-enclosed pistol dot – I weep for those for whom an RMR is not sufficiently durable. Baseball is broken – In which The Ringer says a strike would help baseball players by reforming the arcane and oft-abused service time rules. More parvusimperator’s field, even though I proposed the story for inclusion. Tony Romo is finally going to a Super Bowl – Fragility is not a major impediment for sports commentators, except for that one time Pirates color guy Bob Walk fell out of his chair. College pass interference rules are better – Probably so. See also overtime rules. Is there a gang of serial killers murdering young men across the US? – I’m not a big believer in conspiracy theories, and the article gets Pittsburgh geography all wrong, but it’s still an interesting read. DeLorean Motor Company: the new one – A company in Texas owns all the DeLorean IP, including blueprints and drawings, and eventually plans to make modern replica DeLoreans with modern engines. This entry was posted in All and tagged what we're reading on January 23, 2019 by Fishbreath. Very American-centric, but Six Frigates might be what you’re looking for. It already has a place of honor on my shelf, as it turns out. Mr. Toll’s work is uniformly excellent, if you haven’t read Pacific Crucible and The Conquering Tide.